Photo © ROH. Photograph by Stephen Cummiskey. Smashing plates, women yelling through a megaphone, plastic guns and flying food — not exactly what you envision when thinking about opera. Yet when you get maverick composer and librettist Gerald Barry to adapt Oscar Wilde's famous comedy into an opera, this is what happens. The Importance of Being Earnest burst like a firework onto the London stage when it first debuted at St James's Theatre in 1895 — depicting a society where appearance prevails over all else, where titles are more important than real identity — and thanks to this latest interpretation, it still packs a punch. Why make Earnest into an opera? Why not. By cutting two-thirds of the text but maintaining the essential core, Barry and co create a high-impact, colourful and energetic show. Female protagonists really stand out: the determined flair of mezzo-soprano Stephanie Marshall as Gwendolen is balanced by the extravagance of soprano Claudia Boyle as Cecily — the latter reaching some incredible vocal heights in her Royal Opera debut. Plaudits also to bass Alan Ewing playing a female role, embodying the stern Lady Bracknell. The performance takes place on a bare stage, orchestra mingling with actors. This is no random choice — it highlights the essential role played by the musicians during the performance — both supporting the story with a catchy musical score, and singing along with the cast. At a breezy hour and a half long, this is a show for anyone dipping their toe into opera. It's also for Wilde fans brave enough to revisit Earnest in a very different way. Go on, we dare you. 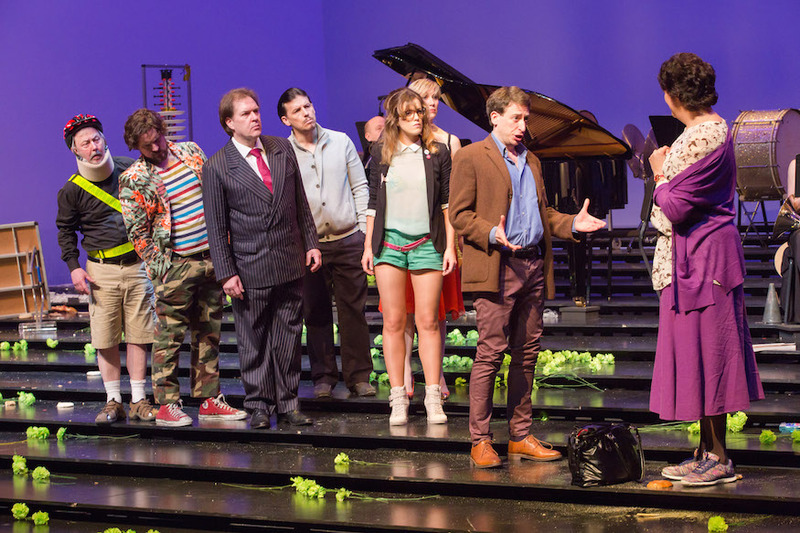 The Importance of Being Earnest is on until 3 April at Barbican Centre, Silk St, EC2Y 8DS. Tickets are £10-£40 plus booking fee, booking online is suggested. Londonist saw this production on a complimentary ticket.